Keep Frozen is an art-practice-as-research project by Icelandic contemporary visual artist Hulda Rós Gudnadóttir exploring harbor aesthetics, the conditions of manual dock labor and the artist’s practice as research. 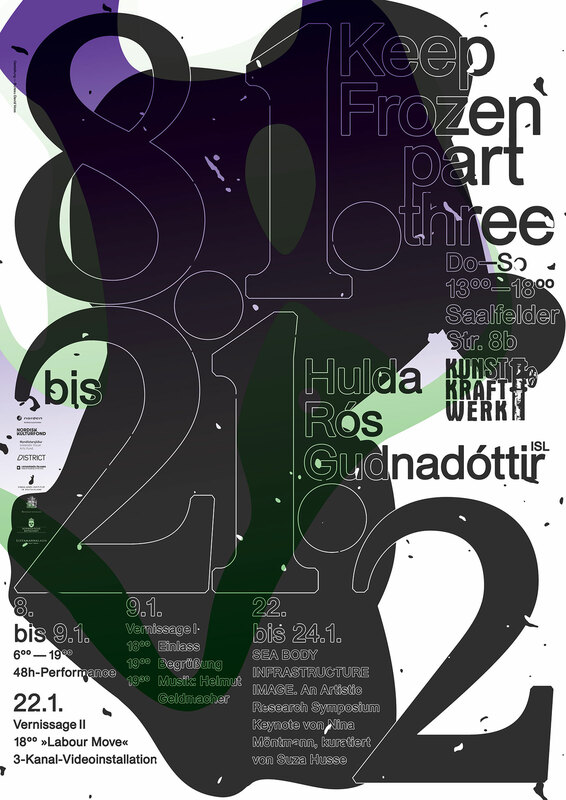 The exhibition at Kunstkraftwerk (KKW) will be the third in the Keep Frozen exhibition series, presenting the artist’s project in Germany for the first time. 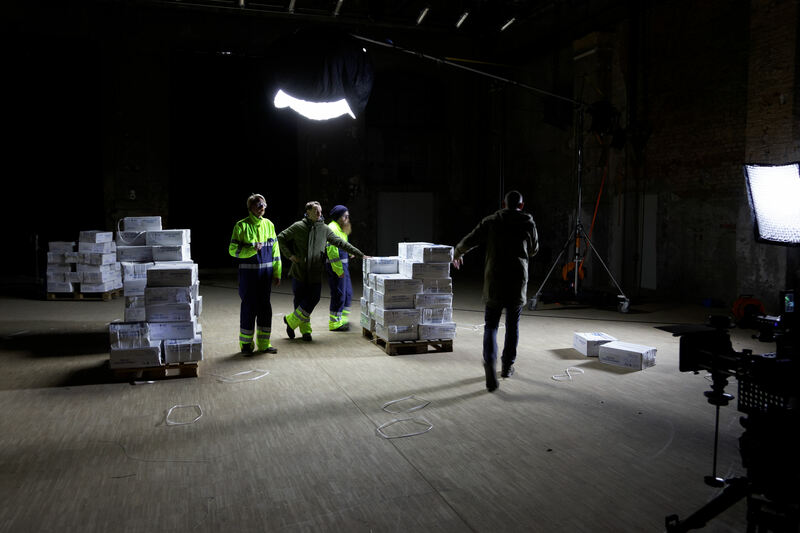 Keep Frozen part three opens with a 48 hour performance by a team of dock workers and a film crew. 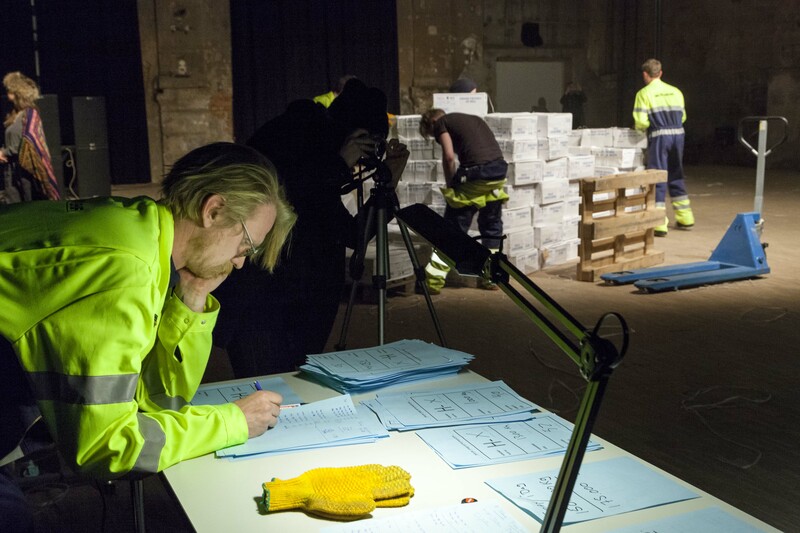 At KKW they will work the same hours with the same breaks as they do at the harbor in Reykjavik where they typically are required, within a tight 48 hour period, to unload up to 25.000 boxes of frozen fish from freezer factory trawlers (each weighing 25 kg) whilst working in a -35° C freezer cargo hold. The boxes are much heavier than those allowed inside the EU and as is the case in the harbor they are paid according to how fast they work. Security rules are waived as they keep spinning. 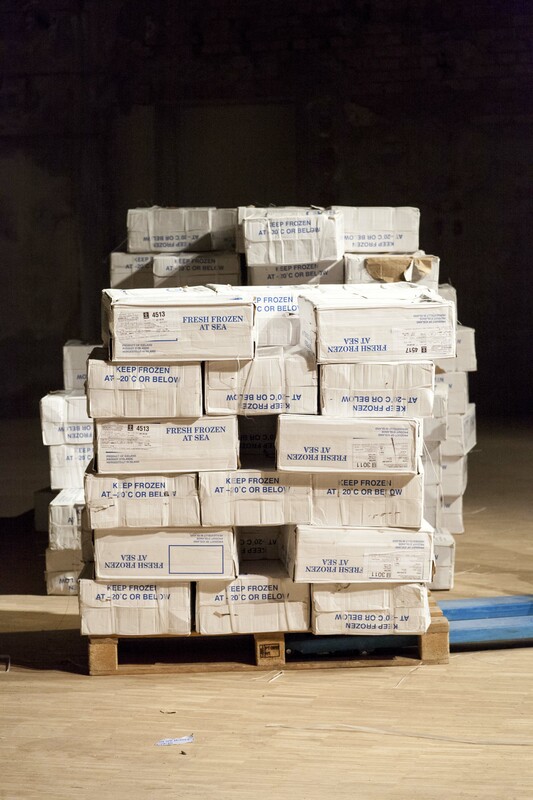 In an endless cycle of repetitive movements they will re-stack boxes continuously as fast as possible from one pile to the next in a ritualistic dance within the 500m2 post-industrial exhibition space. 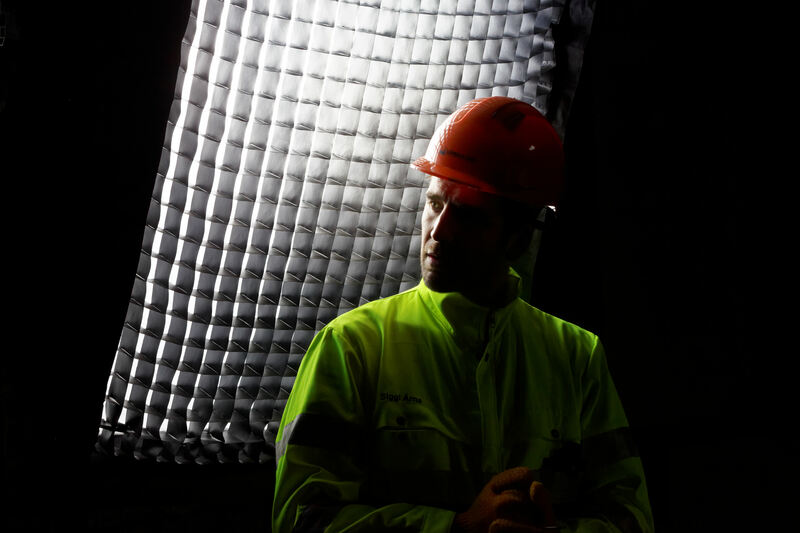 It is an inhumanly difficult task that becomes highly dramatic and is carried out with a precise level of skill and experience that few outside the dock are able to achieve. Due to unavailability of the workers the performance will never be repeated. The performance will be filmed partly by the same team that has been making a documentary about the dock workers in their ‘natural’ dock environment for the last few years. 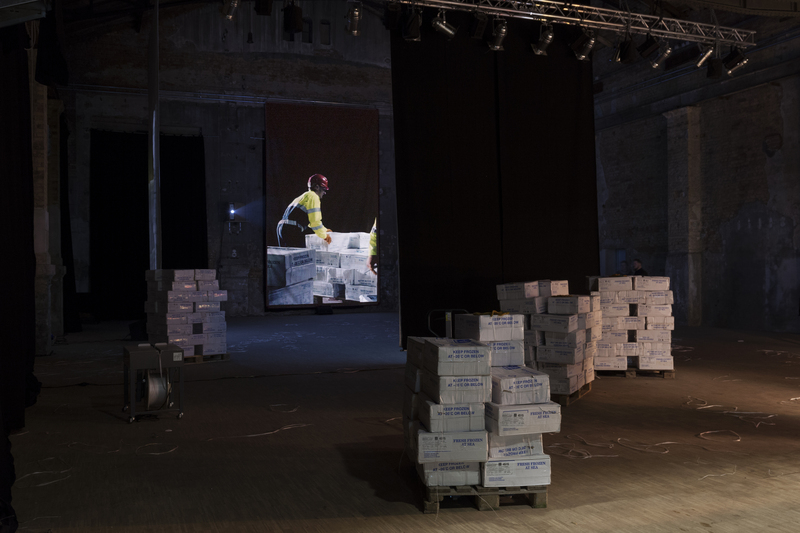 The workers as subjects are thus being taken out of context and restaged in the artistic space that ironically used to be a space for workers. The performance not only poses questions about the space where it takes place but also wider artistic questions. What is (re)presentation? What is (re)staging? What is reen( act)ment? What is (re)production? – in relation to reality/space/cinema? 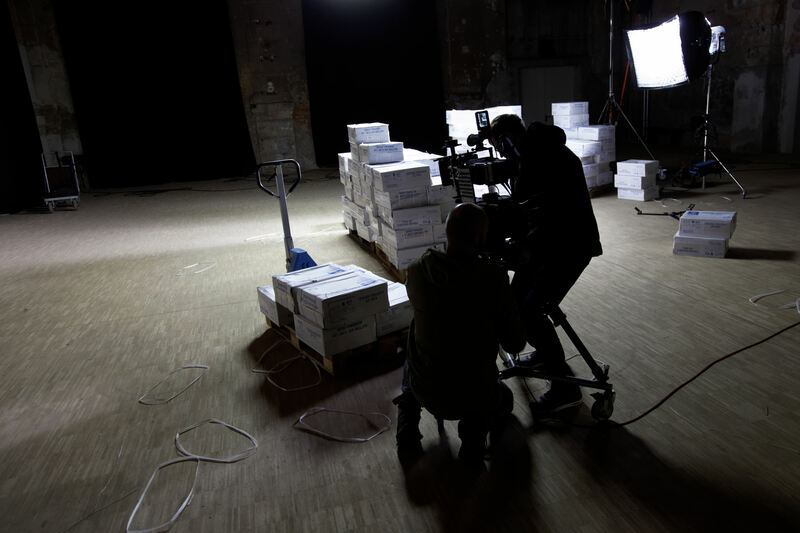 The film crew will focus on abstracting the movements and aesthetic traits of dock labour: by taking the workers and their movements out of context we get to really see their movements, gestures and also hear their sound. The film team will have the incredibly short time of two weeks to transform the footage into an experimental film that will open at KKW on the 22nd of January 2016 as a video installation. 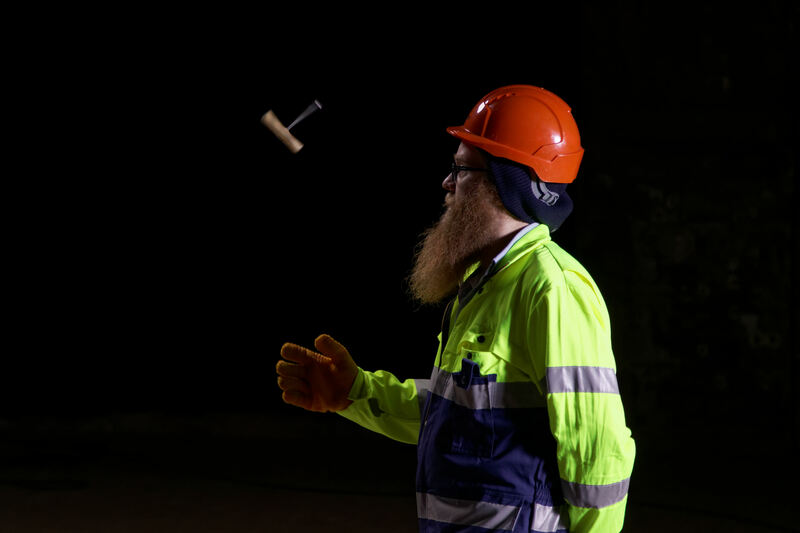 The performance is being developed with the help of Hinrik Thor Svavarsson, an ex-dock worker turned professional dramaturg. In a meeting with the Leipzig based editorial group of the magazine outside the box, the symposium takes a departure point in intersectional feminist perspectives on the politics of labor and forms of knowledge production in relation to social hierarchies and biopolitics. 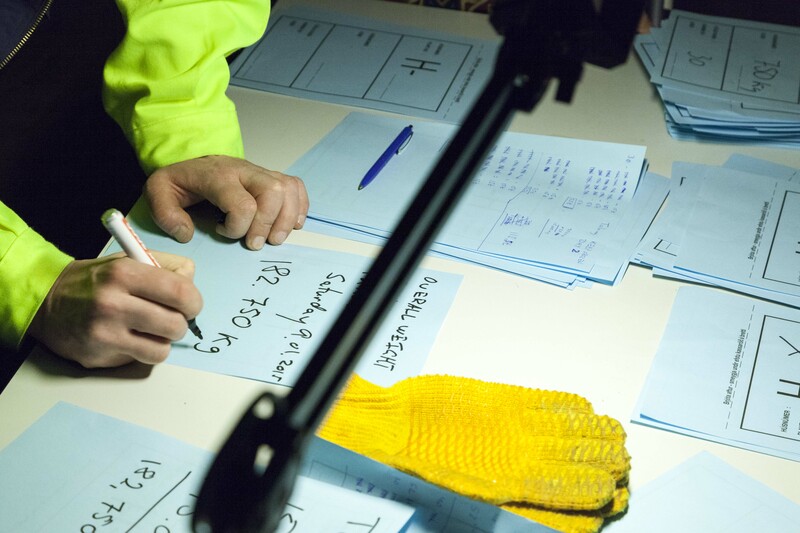 Drawing from critical theory and examples of artistic practice, Jonatan Habib-Enquist’s contribution will address ‘work’ as a potential form of fabricated agency and regard its physical symptoms to demystify the concept of ‘immaterial labor’. With Extended I Exercise – The Class (Dafna Maimon) queer approaches to the body and its performance in the production of images, identities, definitions of self and other are invited to gain understanding of contemporary body intimacies with technological, economic and corporeal infrastructures. Workshop #01 SPEAKING AS FISHES (Emma Haugh & Suza Husse) which concludes the symposium, will “animate” the fish as a presence of (neo)colonial currency traversing oceans, bodies and forms of knowledge as well as a fluid site for reimagining interdependencies and interspecies relationships. SEA BODY INFRASTRUCTURE IMAGE. 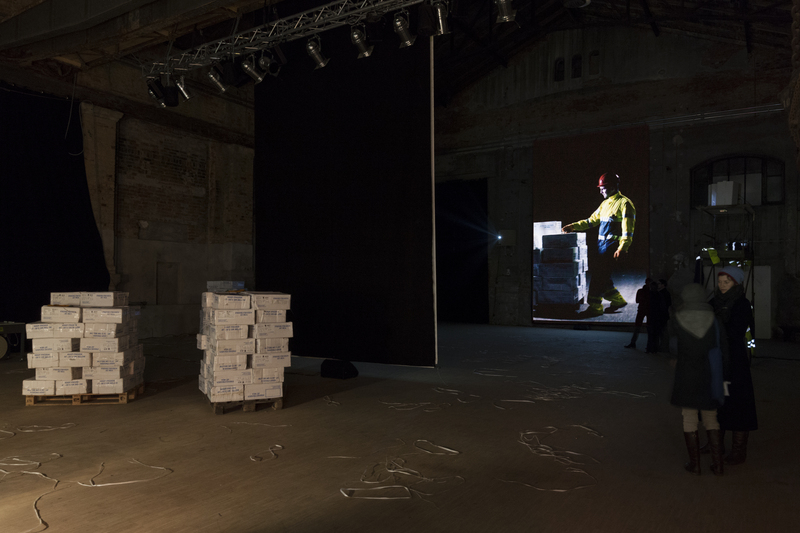 An Artistic Research Symposium is a project curated by Suza Husse and Hulda Ros Gudnadottir in the frame of Keep Frozen Projects at Kunstkraftwerk Leipzig in collaboration with DISTRICT Berlin. The symposium is funded by the Nordic Culture Fund, the Nordic Culture Point, the Finland Institute in Germany, and the Swedish Embassy.